Spondylolisthesis means that one vertebra steps out of the natural line of the spine and thus slips forward or backward relative to the adjacent vertebrae. In very rare cases it may slip also sideways. There are four severity levels according to Meyerding. The main reason to see an orthopedic specialist. Spondylolisthesis may have different causes – and usually several things that contribute. There may be a congenital defect in the structure of the vertebral body, or degenerative processes of the intervertebral discs and facet joints. Traumatic injuries can also lead to a displacement of the vertebrae relative to each other. A spondylolisthesis may also be associated with a generalized bone disease or can develop after spine surgeries – especially if the facet joints had been involved. The pain is responsive to a good strengthening program and short-term administration of analgesics. The main symptom of spondylolisthesis is low back pain. In mild cases, the symptoms alternate with pain-free intervals. In the later stages of the disease, pain may increase and then also become constant. If there is a concomitant stenosis, occasionally also neurological symptoms may occur. The pain can be intense and there may also be weakness in the legs. Paralyses on the other hand almost never occur. 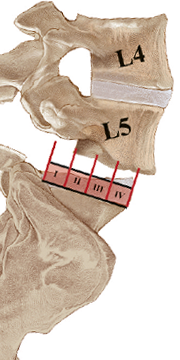 With higher grades of slippage (grade 3-4), the natural double-S shape of the spine is disrupted and the patient involuntarily tightens their hamstrings in order to stand upright. Hardened muscle strands on the back of the legs and associated gait abnormalities are usually the result. Patients with only minor discomfort and a low degree of displacement of the vertebrae can often be helped with a combination of strengthening therapy for the back muscles combined with pain medication. Patients with severe symptoms and a high degree of vertebral displacement, on the other hand, often need surgery to get their pain under control. The main objective of surgical treatment is the restoration of the natural double-S shape of the spine and subsequent stabilization. This is usually achieved by spinal fusion surgery. On the other hand, also pinched nerves often have to be freed. For this purpose, the canals through which the nerves pass – i.e. the spinal canal or the intervertebral foramen – must be widened by mechanical removal of excess tissue.